The non-dairy sources of protein are usually expensive and could leave a vegan with limited options. As a vegan and weight trainer, a non-dairy protein shake works great for me, because it’s low in carbs and high in fiber, proteins, vitamins and minerals. When it comes to Vega nutritional shakes, I am very happy to have them tried in the first place. 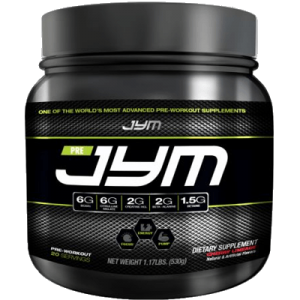 They are extremely helpful for someone who is planning to use them as a meal replacement, or someone who wants to lose lots of weight through training. 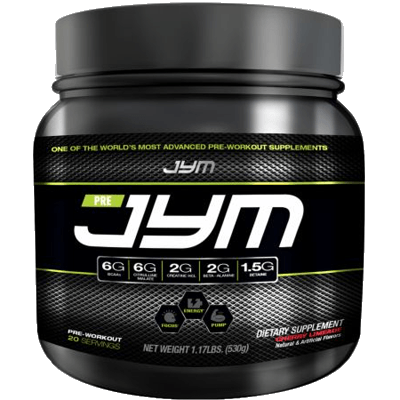 These protein powders usually have pea isolate as their main ingredient while same brands also use soy isolate and brown rice protein. 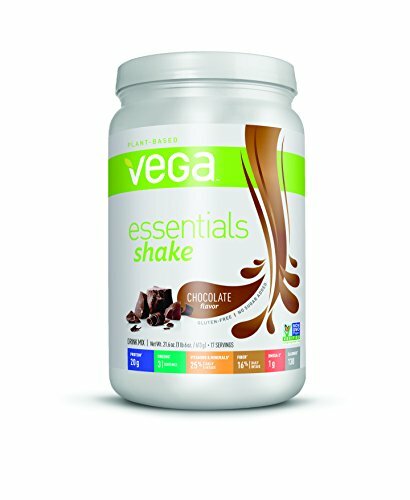 Vega nutritional shakes are, hands down, one of the best protein shakes for vegans. 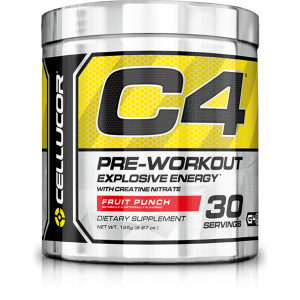 They are packed with so many ingredients that you actually end up replacing your meals with shakes. 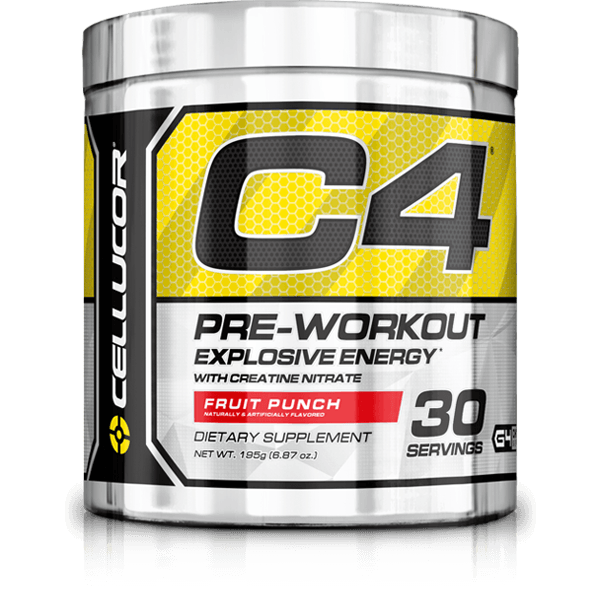 The fiber portion is good, so the shakes leave you satisfied and full for a few hours. Vega nutritional shakes come in a few different options, but the two of their products that I am going to discuss in this article are Vega One and Vega Essentials. 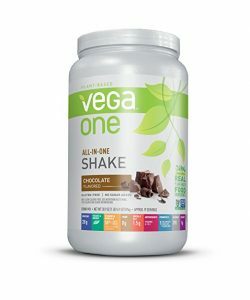 As a starter pack, let me tell you that Vega One is just a nuanced version of Vega Essentials with an all-in-one shake that includes a complete dose of minerals and vitamins in every scoop. The rest, it’s kind of same, trust me! However, Vega Essentials counts as a basic version of Vega One so it’s also cheaper. There are a few similarities between Vega One and Vega Essentials. By spending on either of them, you need to be certain that you are making the right choice. Why? 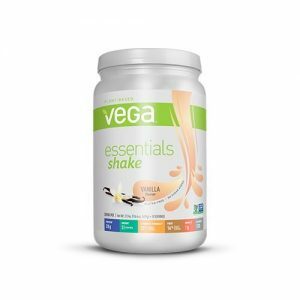 As aforementioned, Vega Shakes are full of plant-based food ingredients. Even for the vitamins, Vega has tried to pack the most of them from natural sources. I am not saying that it’s just simply one of the best shakes out there for anyone, but as a vegan, I have tried it and I believe that it’s quite a fine choice. Let’s first check the similarities between Vega One and Vega Essentials, and then we will move on to the difference. The purpose of this review is to let you choose whether those extra dollars are worth spending when you choose Vega One over Vega Essentials. For every serving of Vega Essentials or Vega One, you get 20g of pea protein. For someone whose main purpose of using this shake is to get plant-based proteins, there’s no reason why they should be paying extra for the Vega One. 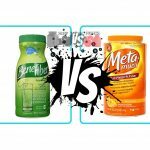 Both shakes comprise of 6 green servings, but what exactly are they, it’s not been disclosed. Vega Essentials vs. Vega One Review: What differs? Essentially, nothing differs much. That’s the whole point. 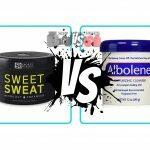 The differences are so minor that you will eventually end up getting Vega Essentials over Vega One unless you are looking for an all-in-one shake. The Vega One is packed with 160 calories compared to 130 on Vega Essentials. The difference isn’t pretty big on the books, but in real, it does make sense, especially when you are on a calorie-deficit diet and every calorie matters to you then. Vega One is great for someone who wants to use it as a meal replacement as it can suppress hunger for around 3-4 hours. 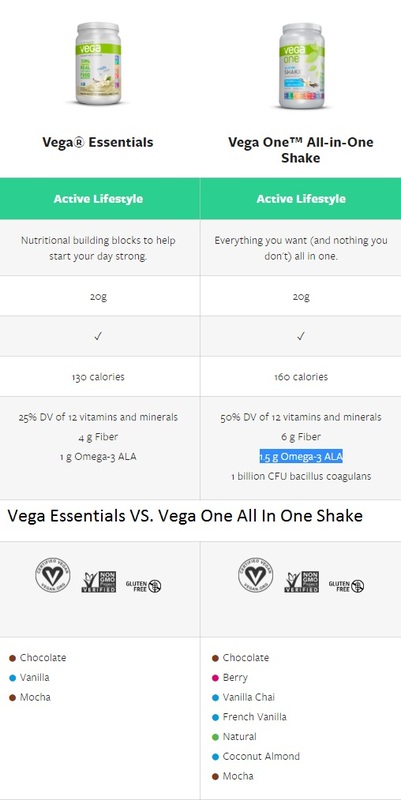 Putting it simply, Vega One has twice the minerals and vitamins than that of Vega Essential, but only in terms of the percent DVs (Daily Value). For instance, Vega Essentials makes up 25 percent of DVs of minerals and vitamins while Vega One provides 50 percent. Vega One also includes slightly more fiber per serving at 6g compared to 5g on Vega Essentials. Omega 3 is essential for some of the body’s most important functions; however, I am not clear as to what source of Omega 3 that Vega has been using as they can’t get it from fish, nor from nuts, as they have clearly stated that they haven’t added ingredients derived from nuts. As far as the dose is concerned, Vega Essentials has 1 g Omega-3 ALA and Vega one has 1.5 g Omega-3 ALA .
Vega Essentials doesn’t have any probiotics in it while the Vega One includes 1 billion CFU Bacillus coagulans. If you want probiotics in your diet but don’t want to spend extra, then Vega One is a better option. However, note that there’s a significant price different in both shakes, so you got to choose wisely. Vega Essentials is retailed around $31 for a 17-serving pack, while Vega One is available for around $56 for a 19-serving pack. There’s definitely a significant difference between the price on the two. With the Vega One, you can get your hands on to premium flavors like French Vanilla, Berry, Vanilla Chai, Coconut Almond, plus the Chocolate, Mocha, and Vanilla flavors that are available on Vega Essentials. There’s not much of a difference between how to the two shakes taste (except for when you choose different flavors), therefore, it’s necessary that you take control of your money by choosing wisely. Vega One does have its upsides and we have mentioned all of them. If you think that you need the probiotics, minerals/vitamins, and more flavor options, then Vega One is certainly a better, all-in-one shake.